Human CD28H, Fc Tag (CDH-H5251) is expressed from human 293 cells (HEK293). It contains AA Leu 23 - Gly 150 (Accession # AAH15655.1). The protein has a calculated MW of 40.6 kDa. As a result of glycosylation, the protein migrates as 45-60 kDa under reducing (R) condition, and 90-120 kDa under non-reducing (NR) condition (SDS-PAGE). 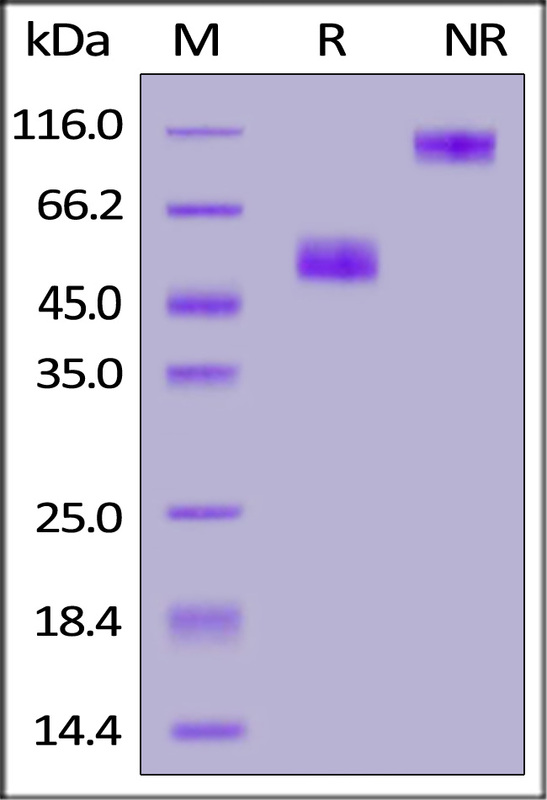 Human CD28H, Fc Tag on SDS-PAGE under reducing (R) and non-reducing (NR) conditions. The gel was stained overnight with Coomassie Blue. The purity of the protein is greater than 95%. Immobilized Human B7-H7, His Tag (Cat. No. 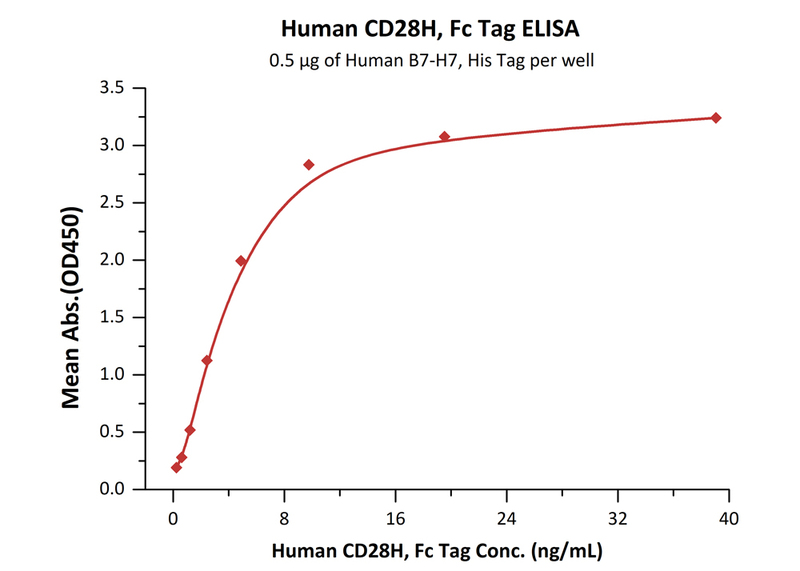 B77-H52H5) at 5 μg/mL (100 μL/well) can bind Human CD28H, Fc Tag (Cat. No. CDH-H5251) with a linear range of 1-20 ng/mL (QC tested). CD28 homolog (CD28H), also called transmembrane and immunoglobulin domain containing 2 (TMIGD2) and IGPR-1,is encoded by the TMIGD2 gene. CD28H is constitutively expressed on naive T and NK cells. After interaction of CD28 homolog with B7 homologue,the peripheral effector and memory T cells can be activated and proliferated by Akt-dependent signalling cascade. Plays a role in cell-cell interaction, cell migration, and angiogenesis. Through interaction with HHLA2, costimulates T-cells in the context of TCR-mediated activation. Enhances T-cell proliferation and cytokine production via an AKT-dependent signaling cascade. (1) Zhu, Y. et al., 2013, Nat. Commun., 4:2043. (2) Rahimi, N. et al., 2012, Mol. Biol. Cell., 23(9):1646-1656. (3) Kaneko, T. et al., 2008, Front. Biosci., 13:4938.